Why buy unfinished cabinets, bookcases or furniture? Few companies offer a wide range of finishes for their products, so you have to take what you can get, even if it does not exactly fit your existing decor or isn't really what you want. With unfinished wood, you can create all kinds of custom designs using wood stains or the paint colors of your choice. You can match the style and finish of existing furniture or create your own entirely new look. Check out our Why Unfinished? page for more details. Why not just refinish my existing kitchen cabinets? Refinishing existing cabinets or furniture is a good option for do-it-yourself homeowners who are willing to put in the effort to strip and recover old wood. However, there is a limit to how much better you improve upon low-quality products. What are your cabinet doors and face frames made of? If they are laminate, veneer, or a low-quality type of wood, then your end result will be less than optimum. For instance, if you have oak cabinets, expect a grainy appearance, even when finishing with paint. If you have laminate or veneer, you can try and apply a good primer and paint. Are your cabinets in stock and ready to ship? No, all our products are built to order from scratch by master craftsmen in the USA, not built in standard sizes and stocked. This means that we can offer a wide range of customizations for virtually any product. Please see the Shipping and Delivery page for details on the different products and timelines available. How do Woodcraft kitchen and bath cabinets compare with brand name lines? Woodcraft cabinets are built with solid wood, not veneered particleboard or synthetic MDF like many other builder-grade brands sold at local home improvement stores. The doors and face frames are entirely solid wood while the rest of the cabinet is solid cabinet-grade plywood. As a result, they can be finished with any custom stain, paint, or glaze. Not only are Woodcraft cabinets made of high-quality materials, but you can customize the sizes and options, unlike most stock cabinet lines. Is it difficult to finish unfinished cabinets myself? It depends. A wood stain and a polyurethane finish can be applied with just a brush or roller. They can also be painted in solid colors and finished off with polyurethane for protection. However, applying a glaze to provide a custom faux finish takes skill and practice. If you are willing to learn, you will be able to create all kinds of dramatic effects. For the best looking cabinets, consider buying a professional-quality "low-pressure high-volume" sprayer. This will deliver a superior smooth finish with no brush or roller marks when painting or applying polyurethane. Click for instructions on applying stain. Is it difficult to install cabinets myself? The most difficult part of installing kitchen cabinets is lifting the wall cabinets into place and aligning them properly. This usually requires two people, but one person can do the job by attaching a 1x1 inch piece of lumber to the wall and building another support to hold the cabinet in place. Otherwise, it just takes time to make sure everything is level and plumb and screwed into the wall studs. For complete instructions, click here. Click here for kitchen cabinet installation instructions. Can I have your company install them? We do not install cabinets ourselves, but can refer you to someone local who would be willing to install them for you. Can I have someone design my cabinet layout? We are not available to make visits to your home, take accurate measurements, and prepare a layout. However, let us know if you need assistance and have any questions about how to plan your layout. Try browsing through home decorating magazines or the pages on this site for ideas. Your cabinets can be custom built to virtually any size you need, and you can accessorize as well, so the possibilities are almost endless. Can I use kitchen cabinets to build a home office? Yes! We've done it. Since most desks are 29 inches high compared to 36 inch kitchen counters, you just need to specify a custom base cabinet height. Desk areas can be created in the corners, for maximum space, or along the walls in between the cabinets. You can use solid wood counter tops as your desk surface. Not only are they much less expensive than granite, Corian, or even laminate countertops, but you can stain or paint them to match or complement the rest of your office. Or, you can place a stand-alone desk in the center of the room and surround it with base and wall cabinets, drawer cabinets, or other options for storage and additional surface area. Click here to learn more about how to arrange a simple home office. What is the difference between a kitchen cabinet and a vanity cabinet? The difference is that the vanity has: 1) no back piece, 2) no adjustable shelf, 3) false drawer fronts at the top instead of real drawers and 4) a height of 31 inches, with a "tall" vanity option of 34.5 inches. How will your unfinished wood products differ from finished products? Unfinished cabinets or furniture require some minor attention to prepare for finishing. For instance, you may need to use some extra-fine sandpaper to remove any hanging strands of wood from the comers. You should also wipe the wood down with a damp cloth to remove any wood dust still on the surface. There will also be unfilled nail holes that will require filling with wood putty, although any such holes will be very small. In some cases, the wood may contain minor defects that can quickly and easily be corrected with sandpaper or wood filler. Kitchen and bath cabinets, like almost all other solid-wood products on the market, are constructed with plywood sides. If you want the sides to be exposed and stained, it would be advisable to select the option for "finished sides." This replaces the standard plywood with a stain-grade plywood. Another option is to cover the plywood sides with a sheet of beadboard or other material that you can purchase from your local home improvement store (e.g. Home Depot, Lowes) and cut to fit. Since the face frame of cabinets are about 3/16 of an inch wider than the sides, the beadboard will make the sides look flush with the front. Woodcraft cabinets and bookcases do not come with any hardware and no holes will be drilled into your cabinet doors or drawer fronts. 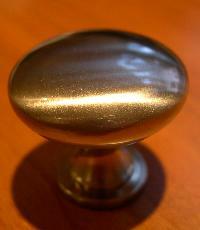 We have some knobs and pulls available, but recommend Rockler.com for a great selection of cabinet pulls. Arthur Brown cabinets, bookcases and other furniture pieces will come with knob or pull hardware and will have holes drilled into them, so please let us know if you do not want any holes drilled. Woodcraft kitchen and vanity cabinets come with completely concealed hinges, which are shown at the right. Furniture and bookcase doors will come with a low-profile hinge pre-installed that permits the doors to open all the way and helps them to stay shut when the door is closed. 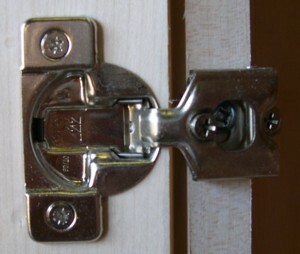 The hinge is not entirely hidden, but only about 3/8 of an inch is exposed. 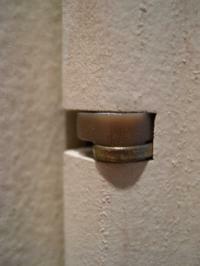 If you prefer to have hinges that are completely hidden, please ask and we can use hidden hinges.